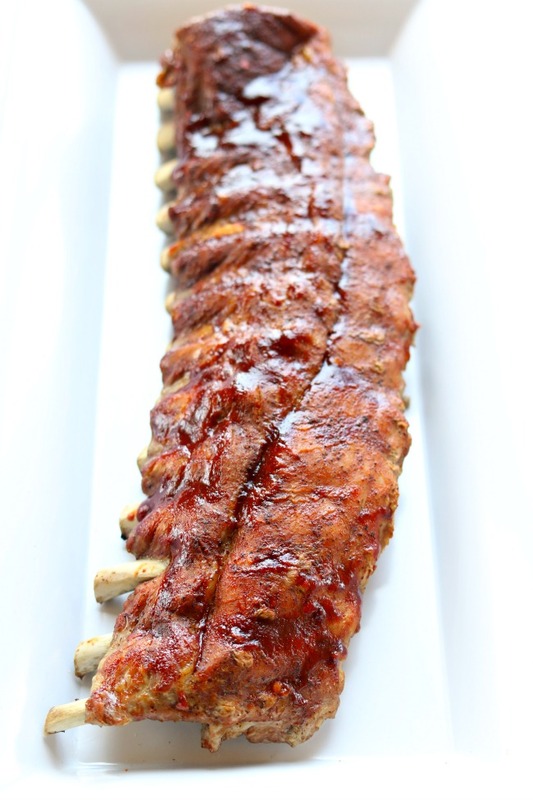 Instant Pot/Slow Cooker St Louis Baby Back Pork Ribs–the best (and easiest) ribs that you can make at home. Fork tender meat that practically falls off the bone. The ribs are seasoned with a dry rub, either pressure cooked or slow cooked, glazed with barbecue sauce, and then stuck under the broiler. Today is Day 11 of 31 Days of Instant Pot recipes! If you’d like to receive all the recipes sent straight to your email you can sign up here. I’m so super excited about these Instant Pot/Slow Cooker St Louis Baby Back Pork Ribs. You see, I have never made ribs like this before and I wasn’t sure how exactly these would turn out. The results were fantastic. Restaurant quality. My husband who loves ribs and orders them often at restaurants was so impressed with the results. We gobbled these up just as soon as they were done. The only thing that takes a little planning is letting the ribs sit in the fridge for a bit of time with the dry rub on them. But after that it’s a super simple process. You place the ribs in the Instant Pot or slow cooker and let them cook until they’re tender. The Instant Pot cooking time is 28 minutes and then using a natural pressure release which means another 25 minutes in the pressure cooker. Don’t try to hurry this process! It’s really important that the pressure is naturally released because it keeps the ribs tender and all the juice will stay in the meat. For this Instant Pot/Slow Cooker St Louis Baby Back Pork Ribs recipe I used this Instant Pot IP-LUX60 V3 Programmable Electric Pressure Cooker. It’s 6 quarts, so the same size as most slow cookers. It cost me around $80 on Amazon. For making this recipe in this slow cooker I used this 6 quart KitchenAid Slow Cooker. The best (and easiest) ribs that you can make at home. Fork tender meat that practically falls off the bone. The ribs are seasoned with a dry rub, either pressure cooked or slow cooked, glazed with barbecue sauce, and then stuck under the broiler. Place the rack of ribs on a cookie sheet and rub the seasonings all over the ribs, top and bottom. Place the cookie sheet into the fridge and let is sit there for at least 30 minutes (I did 45 minutes). If cooking in the Instant Pot place trivet in bottom and pour in one cup of water. Place the ribs in the Instant Pot so that the ribs coil around the inside of the pot. Cover and press valve to “sealing.” Press manual and set the timer to 28 minutes. Once the timer beeps let the pressure come down naturally for 25 minutes and then open the Instant Pot. If cooking in the slow cooker, wrap the ribs around the inside of the crock. Pour the water in the bottom. Cover and cook on low for 8 hours. Remove the ribs from the pressure cooker/slow cooker and place on a cookie sheet. Turn on the broiler of your oven. Baste the ribs on both sides with plenty of barbecue sauce. Broil for 3 minutes. *Here is a good recipe for a dry rub. Use liberally. Hi Karen, tried these today in the insta pot pressure settings. Two slabs of spare ribs, divided into 2 pieces each. Rinsed, patted dry and pulled the membrane off the bone side. Used the rub mixture along with extra garlic and smoked paprika. Now I usually just smoke the ribs on the smoker for 6 – 8 hrs, but wanted to test out the insta pot method. I did a quick braise of the meat, added 4 ozs of beer to the pot, set the unit to meats and then 45 minutes since I was cooking a little over 6 pounds. When the timer went off, fired up the smoker, heavy smoke, applewood chips. Open the pot and carefully pulled out the ribs, any they were falling off the bones. Put them on the smoker for about 45 minutes, rotating the position on the rack. Good smoke quality in the meat. It was a slow low heat process that didn’t dry out. I can now cut down the full smoke time and eat a little sooner and with a little less hassle. I wish I could have tried these! It sounds very delicious! Can’t wait to try these. They sound great. Just a point though, There aren’t St. Louis Baby back Ribs. 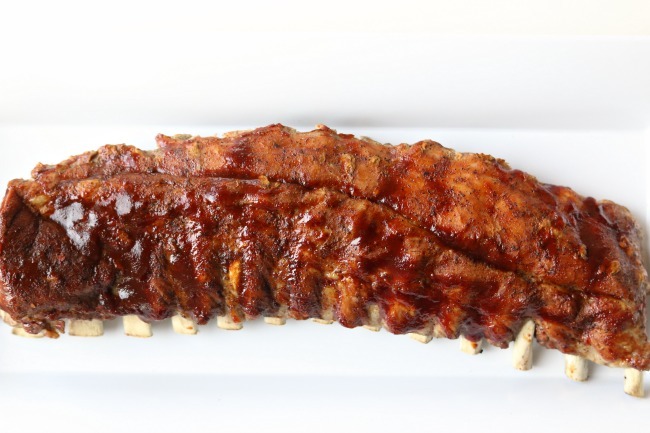 St. Louis is with spare ribs and it refers to the way you trim them up prior to cooking. lol! shows how much I know. These ribs are the best ever. Fall off the bone tender. I am making the Pulled port today. Thank you! Amazing recipe! Ribs turned out perfectly. Quick question- if I wanted to make these ahead of time for a dinner party do I just keep them in the instant pot till I’m ready to serve them and just broil them with the barbecue sauce when I’m ready to serve? Otherwise can I take the ribs out of the instant pot, put the barbecue sauce on the ribs, put them back in the instant pot on ‘keep warm’ and then broil before serving? I would do the first way you mentioned. Thanks the ribs came out great. My first time using my new Instapot and it only took 1 hour to cook. I made a Keto version including Keto bbq sauce. Yummy! Trying it tonight. One question, s.et to manual, my instant pot does not have a manual button. I selected pressure cook. What heat setting should be used? thanks Karen for sharing this delicious ,succulent recipe this is my second time making this recipe and I wouldn’t change a thing. I’m 71 years old and never liked spare ribs ,always thought they never had enough meat on them. now, I cannot enough of them,thanks again…. There’s a difference between St.Louis ribs and baby back ribs. Different cuts altogether. St. Louis has more meat larger than baby backs. So I wonder which ribs you actually used. I like the St.Louis ribs better. Costco has them pre seasoned. Guess I could Google what the cooking time would be for each, albeit a few more minutes for the larger cut? Is there a difference in flavor or texture when doing the slow cookr vs pressure cooker method? Which method are most ppl using? They both turn out amazing. It’s simply up to you and your timing. I think most people use the Instant Pot. Hi, I have a Costco size St. Louis ribs which is around 6.6 lbs. how long would I cook these?! Can you put sauerkraut & juices in the I P with the ribs and not putting water in. I made this in my instant pot yesterday and it was a big hit! Even my picky kids loved it. Instead of water I did a cup of chicken broth in the instant pot. What about cooking more ribs like twice the amount? If they fit, you can do it. Same time. I made pork riblets last night stacked on each other and they turned out great. I Just Decided What I Want For My New Years Dinner! Yummy Can’t Wait! Thanks So Much For The Wonderful Recipe! You’re Welcome! Happy New Year!!! Would it hurt to put ribs in foil while cooking? Would it help keep the juices in? I certainly don’t think it would hurt. Let me know how it goes! yes you just wrap them around the sides of the IP! Could these be done in a crockpot on high for 4-6 hours? Thank you for this recipe, it was great! I had a pre-made dry-rub that I used but the cooking times/technique was perfect. Cant wait to make them again! 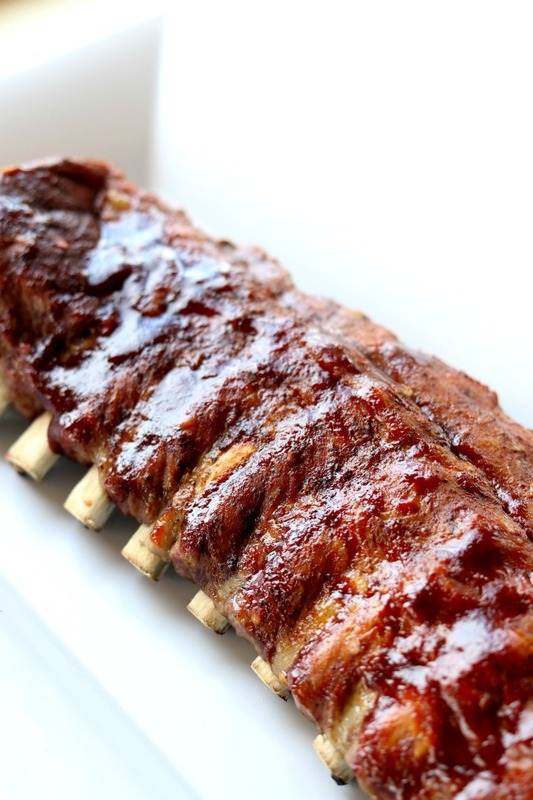 Just made these ribs…..Delicious! Really love the dry rub. My husband loved this recipe! Tried this as per the instructions and they came out perfect. The only thing I did different was hold back the salt in the rub and salted about 30 minutes prior to placing in the IP. After removing from the IP I placed in broiler on high for 3 minutes per side. Great recipe! The ribs were delicious and so easy to make. I’ve been making them like this since I got my Instant Pot. My husband loves them! I also use the regular pork ribs which are usually too tall when coiled inside the pot so, I cut away the taller portion and just lay it on the trivet. It works just as good.